Cauliflower is a Paleo powerhouse veggie, and that could not be more true than during the holidays. 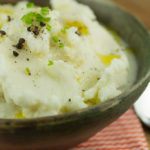 With good quality olive oil instead of butter, these mashed “potatoes” will be the start of the show. When searching out olive oil, there are a couple of things you can look for to ensure that you’re getting a quality product. The first is to buy extra virgin oil. This ensures that it is fresh. Also, seeking out a cold-pressed oil is best, as that means no heat or chemicals were used to extract the oil from the olives. Also, always make sure your bottle is dark; this protects the oil from oxidation. 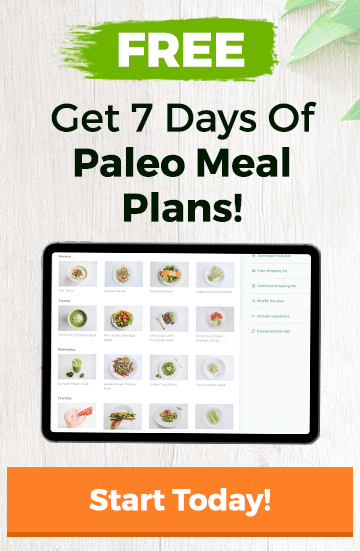 You can also make this recipe come together with much less mess and time if you are able to find cauliflower that has already been riced or cut into florets. You can usually find these products in the refrigerated or freezer section of your grocery store. Remove any leaves from the cauliflower and chop both the stems and florets into small pieces. Put in a large saucepan and cover with water. Add a pinch of salt and bring to a boil. Reduce to a simmer and simmer for 15 minutes, or until very tender. Drain. Add the coconut milk and olive oil and mash with a potato masher. 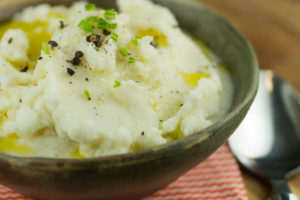 For creamier cauliflower, use an immersion blender to puree until smooth.